Scoop.it is a robust content curation technology that assist users to save time finding the content needed. This intuitive publishing platform allows publishing to be easier to reach goals. Scoop.it’s smart suggestion engine crawls more than 30 million web pages every day to minimize efforts to find great content. Discover how to automate content through the big-data semantic technology by simply entering a few keywords and the platform will find content gems to easily curate and publish content to your social networks, web sites, blogs, and newsletters. To get started, find a topic which is the subject matter wanted. Use Scoop.it to help curate and publish content. It consists of a topic title to identify the subject; one or several keywords that Scoop.it will use to search and suggest content related to that topic; the language to be used for that topic; and a topic page that will archive and display all the curated content to publish on that topic to be used as a blog or content hub. When users sign up for their account, the first thing they will be prompted to do is to create a topic. Next, to select the language for these suggestions to curate and receive content suggestions in. Next users enter a few keywords that are related to the content that is planned on being shared on the topic page. These can be adjusted later. Scoop.it will use these keywords to generate sources for Suggestion Engine and feed content that comes from these sources from around the web. Make the most of the Scoop.it suggestion engine by prioritizing the freshness or relevance. Users can prioritize freshness and get recent content first. 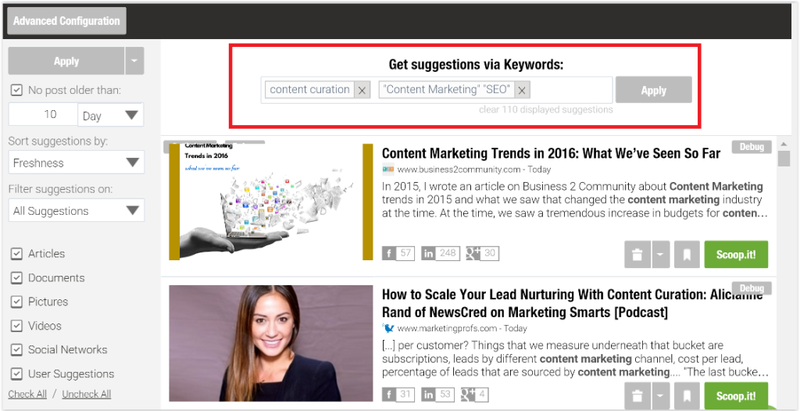 Users can monitor specific sources on specific keywords and manually add these sources to Scoop.it Smart Suggestion Engine to see content suggestions from manually added sources that match your keywords. For example, to curate content from influencers in a particular industry can use the process to add to blogs as sources and turn off the Scoop.it Suggestion Engine. Only content will show up with the availability to platforms.